On sunny days spent mooching around Nolita, gimme! 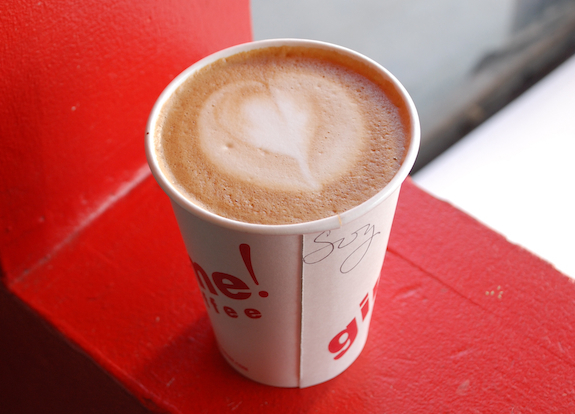 coffee’s hole in the wall on Mott St is exactly where you wanna stop for a drop on the go. Or take a seat on the bench outside and revel in the sunshine now it’s finally (sort of) arrived! The original café in Williamsburg, a block or two down from Second Stop Café on Lorimer, has room to sit, and – though it’s a little lacking in atmos – can also be relied on for great coffee, all of the time. Perfect when you need a fix and don’t want to mess around. Gimme! roast their own beans too (on a small farm just out of Ithaca), so if you’re in the market, now you know where to go for gold. Plus, they’re all about supporting sustainable farming practices, which makes me even happier to tell you how happy a coffee from gimme! will make you. Close to: Roebling Tea Rooms, Oslo Coffee Roasters, Cupcakeland, Momofuku Milk Bar outpost, Saltie. Close to: Baba, Second Stop Café, Barcade, Open Air Modern. Close to: Café Gitane, Café Habana, Torrisi Italian Specialties, McNally Jackson Books, New Museum. Gimme! also have a few locations in upstate New York. For more info check out their Website.